This show pairs two artists from contrasting backgrounds that share a canny mix of an every-day hands-on approach with technical and contextual savvy. Evan Holloway (born USA 1967) makes idiosyncratic sculptures with an aesthetic more akin to hippy craft workshops than contemporary artists studios, turning matters of taste and any appreciation of slick fabrication on their head. Subtle comments on modern sculpture’s legacy are interwoven repeatedly with playfully painted colours and figures that often appear to be physically trapped within the works themselves. Extensive uses of varying materials combine to produce a complex amalgamation of mathematical, alphabetical and geometric systems, colour spectrum charts and three-dimensional diagrams of social structures with a primitive pleasure in people making and engaging with man-made objects. Rose Wylie (born UK 1934) makes monumental and uncompromising oil paintings depicting all manner of images drawn from her lively visual memory. Inspired by ancient wall paintings, early Renaissance and metaphysical painting and primitive cultures along with an appetite for consuming films, news, magazines and celebrity, an intoxicating mix of the primitive and contemporary is laid bare. Never using photographs as reference, the once clearly remembered images are eventually broken down to raw, physical renderings, which capture and convey both social/political commentary and observations, and the phantasmagorical qualities of the situations depicted. There is an energetic thrill and emotion brought on by the immediacy of subjects executed with an apparent disregard for convention – abandoned for the pure physicality of making a painting. Applying a defiantly unsophisticated working method, these huge paintings command a deceptive loss of control and reason. 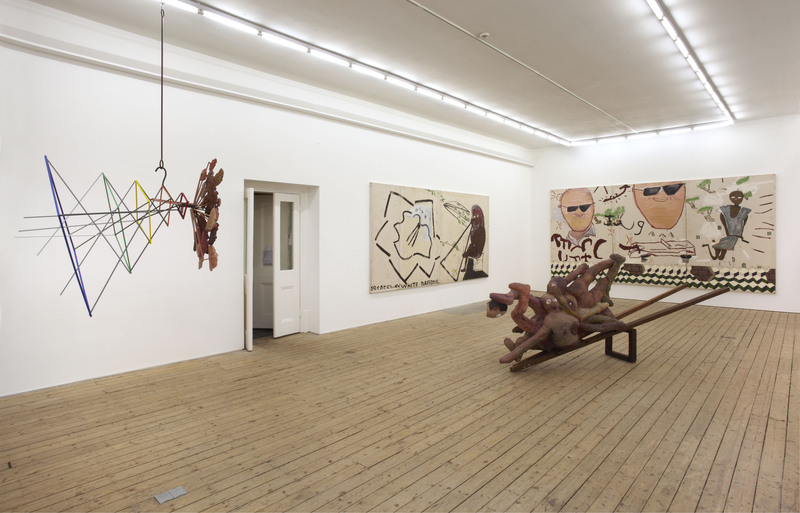 For this show Rose Wylie presents two new paintings. The large triptych ‘Peter Pan and Wendy’ depicts a property developer and his partner, painted with typical reference to Egyptian Hajj paintings. This is accompanied by a diptych, that on one side shows an awkwardly painted Euclid contemplating a small, white flower, and on the other an enlargement of the same flower revealing it as a cheap Safeway daffodil. Evan Holloway shows a large, lushly hand painted sculpture, offering his audience a transformative viewing experience as it becomes quickly apparent that what appears to be a slightly goofy sculpture is actually a ghastly mass of mangled and dismembered bodies. 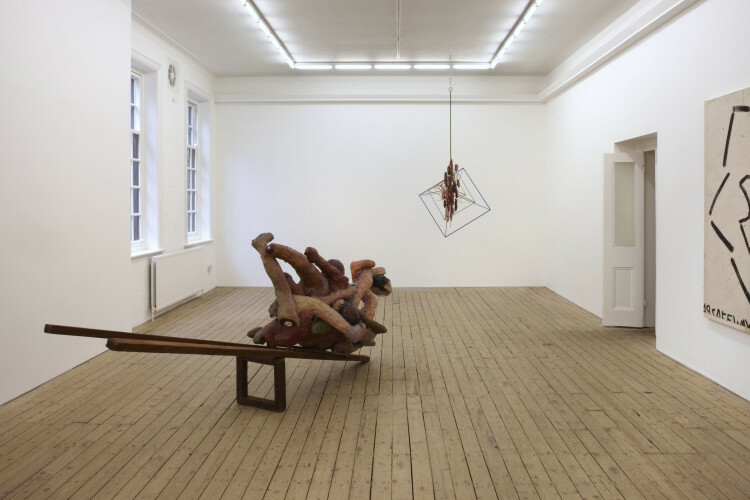 Also hanging in the gallery is a mobile construction of painted papier-mâché human faces, which plays with the tendency of viewers to project personality and mood onto the most basic and crude representations. Evan Holloway has shown extensively throughout the United States and internationally, including exhibitions at Hammer Museum, Los Angeles (2011); Harris Lieberman Gallery, New York (2011); CCA Wattis Institute for Contemporary Arts, San Francisco (2009); Pomona College Museum of Art, CA (2008); Marc Foxx, Los Angeles (2008), Xavier Hufkens, Brussels (2005); San Francisco Museum of Modern Art (2004). 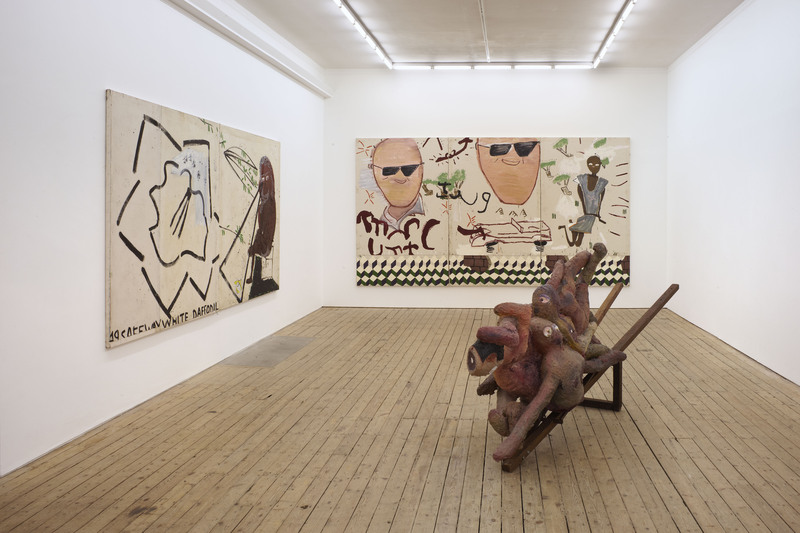 Rose Wylie is represented by Union Gallery. She was selected to represent the UK at the National Museum of Women in the Arts, Washington DC exhibition ‘Women to Watch 2010’. Recent exhibitions: Thomas Erben, NY (2010); Timothy Taylor, London (2010); Turner Contemporary Open, UK (2009); Kate MacGarry, London (2008); Transition Gallery, London (2008); EAST International, Norwich Gallery, Norwich (2007). Forthcoming solo exhibitions Michael Janssen Berlin (2011); Regina, Moscow (2012).